Today I spent most of the day behind the computer, catching up on the second, and most time-consuming, phase of the photographic process—editing images. I’ve discovered that I enjoy this process nearly as much as capturing the images. Often, as was the case with DBA Perwa’s shoot, after downloading the hundreds of shots I’ll scan the images and find a few that I really like. It’s only later, though, during the editing process, that I’ll discover a hidden gem awaiting me. Today, it was this photo of Perwa, one that I’d originally overlooked, that made me smile. Although it’s not the type of photo Arabian fanciers would necessarily choose, this is the one that I’ll always remember when I think of Perwa. Oh so pretty, she (I trust it is she) looks like a young lady flirting with her hair all mussed, feeling free and energetic. It is the one I would choose as well–this is a powerful shot showing the majestic wonder of Perwa. Thanks for sharing. Thanks so much! for the comments! Yes, I got that feeling, too. 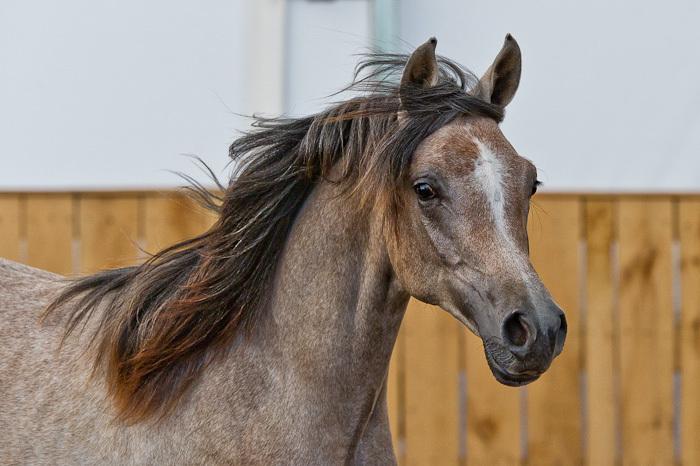 A young lady with her mane flying, confident and powerful.